I love thrift stores! This should be no surprise to you. If I go too long between visits, I get a bit antsy, and start planning out my next visit. I wouldn't call it an obsession . . . I went to Goodwill last weekend. I was looking for pants, but I struck out in that department. I was also looking for fleece scraps to use for cloth baby wipes—found a great piece for less than $1. Score! I was also looking for a teapot—struck out. 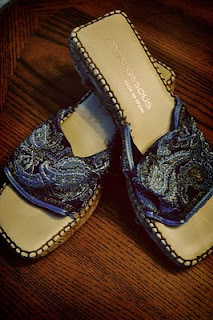 And, while I wasn't really looking for them, I found a super cute pair of Andre Assous slides for our upcoming beach trip. I paid under $5 for them!